Pictures by Justin Lee. A couple are linked to hi-res versions. Last year (June 2001) Justin and I attempted Mt. Shasta and were turned away by nasty weather: gale-force winds flattened Justin's tent, both metaphorically and literally. We spent the winter scheming and plotting our revenge; in particular, Justin purchased a 5-pole, 4-season expedition-grade North Face tent. Then a smooth-talking salesman convinced me that I need a separate 'summit pack' (doubling as a sleeping bag stuff sack) and a high-altitude stove. OK, OK, here's my credit card. David Rockower and Rob Vaterlaus signed up for the climb. Since small equipment omissions can have a major impact (e.g., not having a utensil to eat with) I prepared an equipment checklist and emailed it to everyone. We meet at my house in the late afternoon and drive to Mt. Shasta City in Rob's gas-guzzling Jeep Cherokee. The sun is my eyes Rockower introduces a Botticelli variant involving abstract concepts ('the anthropic principle', in particular). It's not clear if this will catch on. We stay at the Evergreen Motel, which actually has more of a curry scent. The next morning we have extravagant breakfasts at the Black Bear Diner, buy our summit permits, receive warnings of rockfall and 'cumulus buildup', and stop at the Fifth Season where Rob buys last-minute items. The hike to Helen Lake is sweaty. We pass a large group of climbers in yellow helmets, dubbing them 'the ant farm'. Rockower, an amazingly fast hiker, goes way ahead. The final snowy stretch is a slushy mess, and I shift over to a rock/dirt slope - far worse. Only a few people are at Helen Lake (which, as usual, is frozen over). Rockower at Helen Lake We camp in rock-walled tent sites, piling rocks on the tent pegs in case of wind. It's about 3 PM, and the sun is still high. We rest and nap in our hot tents for 3 hours. In a nearby group, a guy with a booming voice yells 'how are my little base-campers?' to his friends. Rockower dubs him The Extrovert. We get up at 6 PM. I light the stove, and Rockower and Justin bring a big pile of snow to the cooking area in a ground cloth. The GigaPower stove. Note pile of snow. We're all queasy from altitude and exertion, and we choke down our freeze-dried meals. We fret about drinking water; I didn't bring very much fuel for the stove. The setting sun illuminates the huge snow face of Avalanche Gulch, scored with the paths of falling rocks (some quite large), glissade ruts, and a few snowboard tracks. Avalanche Gulch. Red Banks at the top; The Heart (a.k.a. The Buttocks) just below. It gets cold quickly and we retire. I take a sleeping pill, and am quite warm and comfortable, but still only manage a couple of hours sleep. I'm apprehensive about tomorrow. Will my body, a year older and more tired, hold up? Is that a twinge in my chest? Will I have a heart attack on the mountain, like my late friend R.D.? Since I'm not sleeping, it's easy to get up at 3 AM. It's calm and unexpectly warm. The giant snowy mountain glows under a nearly full moon. Street lights shine in the valley far below. I feel good. We have instant coffee and oatmeal, put on crampons, and are on the snow at 4 AM. Rockower and I go ahead. The snow is a little soft, but I follow some compacted footsteps. Soon I settle into a wonderful hypnotic trance: reading the tiny clues in the snow to find the solid foot placements; traversing diagonally to locate the best snow bands; cycling between side-stepping, front-pointing and duck-walking to use different muscles; and finding a combined rhythm for breath and steps that lets me keep moving without frequent rests. The sky slowly lightens, and I turn off my headlamp. As the sun rises, the mountain casts a gigantic shadow to the west. At 6 AM I'm at the Red Banks, at the first chute to the right of the Heart. Me about to reach Red Banks. Rockower and Justin arrive, laboring a bit in the deeper snow. Justin and the shadow of Shasta. We don't see Rob anywhere. I'm shivering, so Rockower and I press on, front-pointing up the steep chute, then up onto the plateau below Misery Hill at about 13,000'. Everything combines to produce an almost overwhelming joy - the beauty and personality of the mountain, the ever-expanding vistas, the warm sun now shining on us, the feeling of physical energy, maybe some endorphins kicking in. Now I know that I'll summit, and it will be easy and fun. Rockower and I rest at the stone circle. We wait for Justin, but he doesn't appear for 10 minutes so we continue up Misery Hill, using a band of snow on the right side. By zig-zagging and controlling my rhythms I climb it without stopping, enjoying every step. Rockower, who is in tremendous shape from running, is right behind me. We emerge onto the summit plateau - the point where Justin and I turned around last year. The summit pinnacle looks far away, but actually it's just a short dash across the plateau, then a few switchbacks. We're on the summit at 8:30 AM. 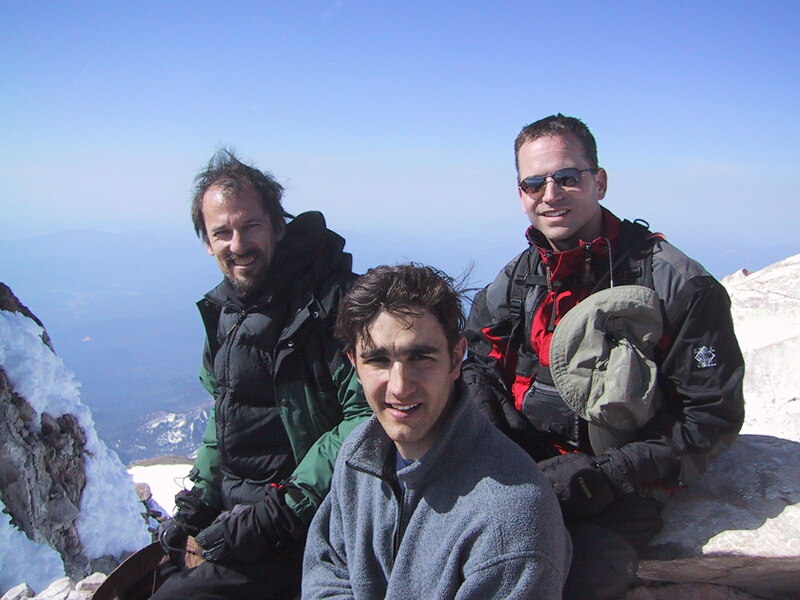 We make ourselves as comfortable as possible on the spiny rocks of the summit (Shasta offers no comfortable rocks, anywhere) and chat with a studly young climber from Sonoma. We've given up on Justin and Rob, and feel sad about this. Below, a tiny figure moves across the plateau with agonizing slowness, pausing every few steps. It's Justin! It's so calm that our voices carry to him. At 9:20 he's on the summit, and the stud takes a group picture. By 10 AM it's time to head down. A group of climbers is coming up the final switchback. I stop in front of their leader, who looks kind of like Rob, and stare blankly at him. Suddenly I realize that it IS Rob!! The day is now a total success. I go berserk, yelling back up to Justin and Rockower 'Hey, it's Rob! He made it!' Rob is slightly embarrassed by my behavior. Justin goes back up to the summit to get a picture of Rob. Rob at the summit, looking a little beat. Rockower and I descend to a sulphur fumarole a hundred feet off the path, and he conducts a chemistry experiment. Then we walk across the plateau, take off our crampons, and do a series of glissades that takes us down 4,000', and to within 200 yards of Helen Lake, in a few very exciting minutes. This looks like a glissade track but in fact is not The chute at Red Banks is scary. 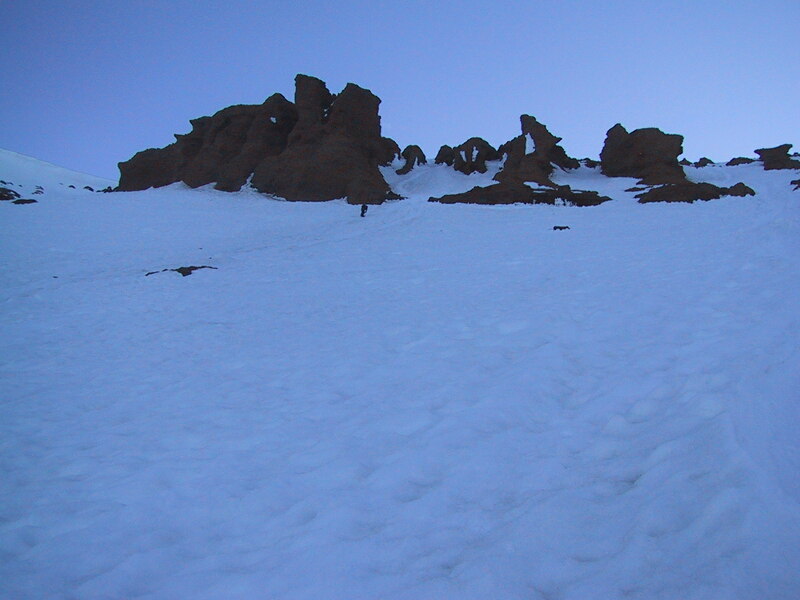 A number of climbers, inexplicably, are starting up the now-slushy snow of Avalanche Gulch. It's clear that our early departure was critical. We drape our snow-drenched clothes over the warm rocks and rest in our tents. Justin and Rob arrive after a while. We break camp and set out. Just below Helen Lake, a large boulder comes tumbling down the slope near Rob and Rockower - our only brush with rockfall, and a scary one. Justin has developed a good technique for descending slush (heel plant in new snow) and instead of taking the rocky trail, we continue down the snow-filled gully. This is an extremely good decision as it vastly reduces the shock on knees and back, which I dread. Eventually the snow gives out and we're forced to go on Olberman's Causeway, with its maximally-inconvenient spacing of large rocks. At Horse Camp we learn that the 50-ish couple in front of us has summited from the parking lot in one day. Rockower tries to minimize their accomplishment by claiming that we did 3/4 of it, but his arguments are not accepted. Usually the last 2 miles is a nightmare, but Justin and I chat about classical music and it goes by in a flash. We load up the car, stop for high-fat food at the Burger King, and enjoy a silent, serene ride back to Berkeley. For me, negligible: slightly sore big toes, and a hamstring cramp from glissading. My surgically repaired right knee has some tweaks on the descent. Justin has sore legs and shoulders. The weather and climbing conditions were excellent - the best of this year, and perhaps any year. Everything went right. Perversely, part of me wishes that there had been more in the way of challenge and hardship. Justin and I discussed doing another '14er' next summer.